My former Art Director at La Voz de Galicia, Jesús Gil, used to tell me that people loves the kind of graphics which include things to "do it yourself at home". We made several graphcis that way, as one in which we told the readers to press a foam ball to show how the earth fklattened at the poles. But truth is that that kind of graphics, a sort of "experiment", works very well. Always I always try to include these kind of details on mygrphics, when it's possible: drawing the shape of Michael Phelps' foot, the way readers can comper their feet to Phelps', drawing trimable bookmarkers to get ot included beside a Book Fair distribution graphic, comper things to the actual size of the newspaper... Searching interactivity also in print. Now, Michael Gee, makes the double gamein the The San Jose Mercury News web. From internet, creates interactivity using the print. And he does it with this graphic about Transformers (remembrances of my chilhood stained now by the worst looking film of all times). 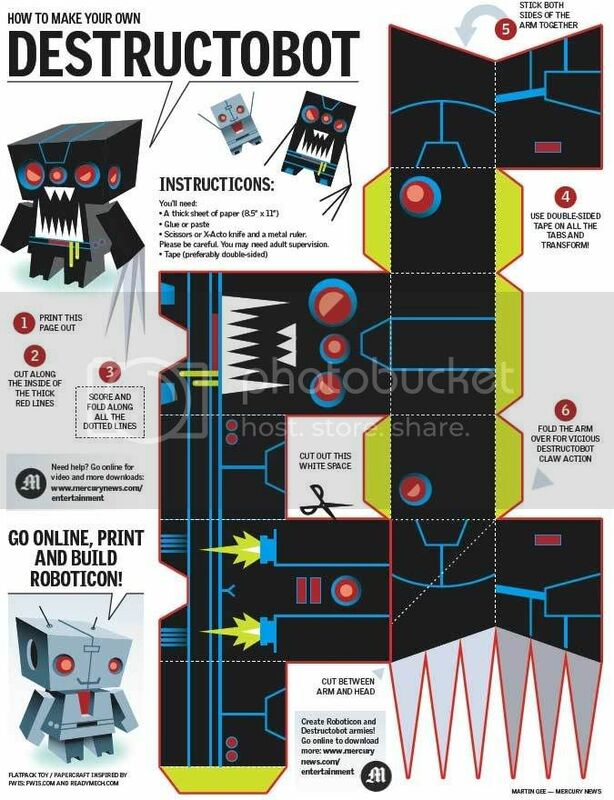 On it, calls readers to print bluepritns as the showed below to build up your own Transformer (bad or good guy), and uses the online to show a video tutorial.